Have you noticed the way everyone is using twitter as a reliable source for gossip and current events these days? The news will quote a tweet or two most nights, television shows are encouraging you to use #hashtags to comment about the episode in real time and the number of people tweeting and listening is growing all the time – there are 11 new accounts created every second! The best thing about twitter in my opinion is that it is so available and open to anyone. You can tweet to your friends, follow famous people and get up to the minute updates for pretty much any service currently available. The marketing potential of twitter is huge, so just about every business has created a presence and is flogging their wares. And while it can be a great marketing tool, it is also a good listening post and a way to gauge consumer perception, which is often what businesses are more interested in. Did you know that twitter is one of the biggest real time search engines on the internet? If you want to know what is trending around the world right now, or what people are saying about a certain topic, then twitter search is perfect for this. In fact it is so good that twitter is used as a search engine more often than both Bing and Yahoo combined. So how does this help our finances? Easy, it gives you a direct line to just about any service you want. If you are having a tough time with a business over the phone, try tweeting instead and see what happens. Most of these businesses are dedicating time to monitoring what is being said about them and they are generally very quick to put out a fire on social sharing networks for fear of bad news going viral. 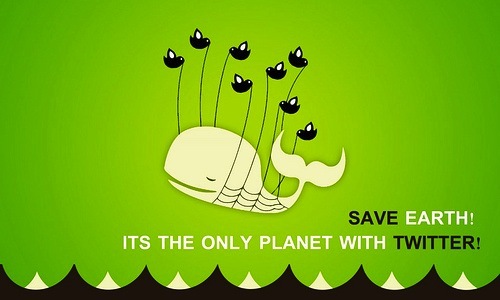 If you don’t have one, sign up for a twitter account, it takes no time at all. Find your bank by searching twitter for them by name. Once you find them, go to their profile page and click the follow button. Compose a thoughtful tweet and insert the bank twitter name so that they will see they have been mentioned. It is highly likely that the bank will friend you, then tweet back with a generic message asking you to Direct Message (DM) them you phone number. Before you know it you are talking with someone from their central branch who can provide a lot more help and make a lot more decisions on the spot. I’ve had some very good success with this in the past, particularly with banks and other large service providers. I suggest you try experimenting with this technique to see how it can help you. 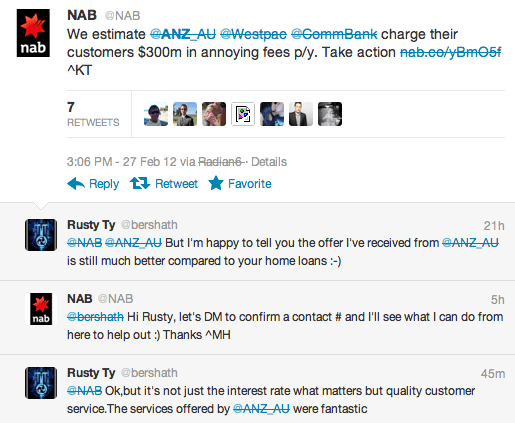 Tweet to your bank or even better a competitor and ask what their best home loan rate is, or if you can have a discount on other fees. There is so much competition around at the moment that banks will be unusually helpful in an attempt to either keep you as a customer, or lure you over as a new one by offering some very nice incentives. Tweet to your insurance company to comment about poor service or something you need help with. Big service providers really don’t want to see people complaining about them online, so they are usually pretty good at following up. If you can’t get what you want by phone, jump onto twitter instead. Tweet to your gas, electricity or other service provider to sort out a billing issue. If you are having problems, go ahead and complain on twitter. There is really no need to wait on the end of a phone to chase up problems, these days any decent service provider is willing to do the running around for you! I’m sure that you can think of lots of other ways to use twitter to get a better service and save your time and money, so go ahead and give it a go. I’d love to hear about your experiences in the comments below as well.